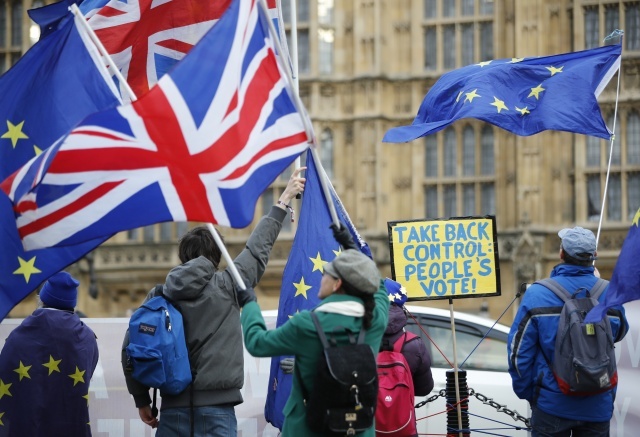 Anti-Brexit activists wave EU and Union flags as they demonstrate outside the Houses of Parliament in central London on January 21, 2019. British Prime Minister Theresa May unveils her Brexit "Plan B" to parliament on Monday after MPs shredded her EU divorce deal, deepening the political gridlock 10 weeks from departure day. (AFP) - Britain's main opposition Labour party has proposed MPs be allowed to vote on a second referendum as part of a series of options to stop a "no deal" Brexit. A parliamentary amendment tabled late on Monday would require ministers to allow time in the House of Commons to discuss ways to prevent Britain leaving the EU in March with no deal. These options include renegotiating Prime Minister Theresa May's Brexit withdrawal agreement to include a new UK-EU customs union and a "strong relationship" with the EU's single market. They also should include "legislating to hold a public vote on a deal or a proposition" that has the support of a majority of MPs. MPs roundly rejected May's Brexit deal last week but she still believes it can be saved and has promised to return to Brussels to secure further concessions that might win over her critics. She will return to the Commons next Tuesday when MPs will have a chance to debate her approach and vote on amendments offering a different way forward. The Labour amendment has little chance of success as it would need the support of members of May's Conservative party, who are unlikely to back a plan proposed by Labour leader Jeremy Corbyn. But the very fact that a second referendum is now being openly discussed was welcomed by campaigners who want to stop Brexit altogether. "It is a big step forward that for the first time my party is acknowledging in a parliamentary amendment that a People's Vote may be the only way forward," Labour MP David Lammy said. There are other amendments that do have the support of pro-European Conservative MPs, including ones that seek to stop a potentially hugely disruptive "no deal" Brexit by seeking to delay the process. Not all amendments will go to a vote. This is a decision for the Commons Speaker, John Bercow, who will make his selection next week.